Upon the suggestion of my good friends Patti and Maryann, I decided to give macarons (or French Macaroons) a go. All the research I did on them before setting out to actually make them made me nervous, like I was going to have to watch 8 batches fall before I was able to make the perfect macaron. Lucky for me, all that research combined with my fear led to a pretty good first attempt. I don’t know that they are 100% perfect, but they are delicate with a slightly crisp outer shell and a semi-chewy cookie center. This seems to fit the description of them, but unfortunately I’ve never tasted a macaron before this batch from my kitchen. Although I hear they are the new trend, my fair city has just begun to embrace cupcakes and so I feel that macarons might be a few years off. I filled this batch with Nutella and cherry preserves, which taste mighty fine, but I’d like to try again with a filling I actually created from scratch. These fancy little numbers were so good that as soon as I took one bite, I called my friend who lives a few blocks away and told her I would be using her for her stomach. I packed up half the batch just to get it out of the house. If I hadn’t done that I might just have O.D.d on delightfulness. The two of us have a nice little partnership going. I get to give her and her husband some of my excess sweets and they give me their mushrooms and cilantro when they forget to request their removal them from their CSA bins. It’s really the perfect solution for everyone. 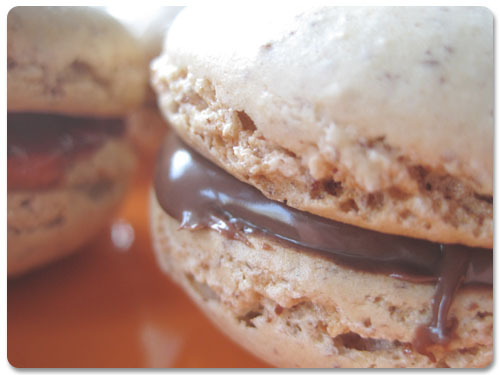 For these macarons, I used the Martha Stewart recipe and found it near perfect – changing oven temps and sifting included. I really like how much attention you have to pay to everything while making them. I used to be an end result girl, but now I’m much more about the process. It’s become a sort of meditation for me — my time in the kitchen, my time knitting or sewing. There’s much less end result product to share with everyone because of it, but I’m loving the reward of taking my time with every little thing. Oh yeah! I forgot my favorite process! I think I’m more of a process person in general. Not a big end results fan EXCEPT with chocolate based foods and books. It’s hard for me to skip pages when reading cause I really want to know how a book ends. Oh yum! Now I want to make these even more! You rock, Claire. Glad they turned out so well for you. Like the Ball jar story too… miss seeing Ball jars around here! 🙂 I didn’t know how good pickles could be, either, until I worked at the Tinsley House. Haven’t tried making any on my own, though.